What would you like from a loving (yet not overly Lego-loving spouse)? Many many thanks. - some old small sets (mainly late 80s and 90s) which were won on eBay - Good because they weren't expected or in my usual scope of purchasing but gave a great little bit of history to my collection. Basically there is no perfect gift, tastes in Lego are massively varied. I recently picked up the #40120 Valentine's Day Dinner set which is a really nice little build, good value with a lot of rare parts and appropriately themed for the occasion - the only thing is you might have to go to a lego shop to guarantee getting one in time as they are out of stock on Lego's website at the minute with an expected ship date of the 10th. hope something in all that helps. I get why you've gone for the keyring type stuff (gear) before and see a set as the "easy" or "meaningless" option but from a Lego fan's perspective it's the other way round. The Lego sets tend to be what we want and the gear is nice enough but not something we'd be that excited about. Think of it as the "I know you like golf so I bought you a tie with golf clubs on it" type gift, connected is good but not necessarily the same. I agree with Shib, I used to collect comics and people knew this. So for Christmas they'd give me weird stuff that was related to comics but I'd have no use for like t-shirts with huge comic scenes on it or bobble head dolls of the Hulk or something like that. Sure the idea is nice and it's the thought that counts but if you collect comics it's comics you want, not necessarily stuff just related to comic themes. The Valentine's Bear of 2014 would be great, but I'm sure he already knows about that...give him something you built yourself: sneak into a Lego store or something, use PAB wall...then surprise him. I've enjoyed the Lego books I've received as gifts. Some even come with bonus minifigures. I really enjoyed LEGO Space: Building the Future by Peter Reid and Tim Goddard - who are both really nice guys, regulars on the show scene and always more than happy to sign books too. Just buy him the #31031 Rainforest Animals set. Even if he has it once you can never have enough shitting parrots dotted around the place, I have 6 of them, the mechanism isn't perfect so I do find I have to clear up Lego parrot crap now and again. It's like having colourful pets, but without the responsibilities. What more could you want? Or for something personalised, I agree about heading to the Lego store and building some custom minifigs at the build a mini bar and base them on things he loves, or that mean something to the both of you. As someone else said you can even throw a pick a brick creation in too. At least that way you know he wont have bought it already because it's based entirely on your imagination, which is one of the things Lego does well. To echo someone above, I just like lego. I would be happy with just about any lego set I received as a gift (unless it was Star Wars) but I don't think I'd want any other lego-related dodads like key chains, mugs, t-shirts, or any other similar paraphernalia. Possibly one of the adult targeted lego books may be interesting but anything else would just be clutter for me. I know it may seem that buying a set is the "easy way out" and is not personal or thoughtful, but really, that is what actually I want. Who else is trying yp work out if we know this AFOL? The blog is very well written by the way. Very entertaining and perceptive. Thanks so much for your great suggestions, really so useful. I think it's going to be a Lego set. A quick look in our Lego Rrom and I see that we already have 2 of this year's Valentine's sets. I like the 2014 bear, so perhaps I'll look for that. @Xefan we have two small children, so I'm sure that a set of shitting rainforest animals won't seem too out of place - I'll have a look. He used to lust after The Black Pearl (is that the right name? Pirates of the Caribbean?) I know it's long gone in the shops, but is it still easily available from resellers? If anyone knows, I guess you're the people to tell me! That's gonna cost an awful lot especially if you're looking for a sealed one - check prices on www.bricklink.com or you never know someone on here might have one and do you a deal, but that's definitely a high bar to aim for. A man with expensive tastes, just my luck... Pernaps that's why he lusts after it and doesn't actually own it! Good Heavens, just seen some for sale. That is one expensive piece of Lego. As an AFOL, I'd agree with all the comments above. Something that he likes but can't bring himself to buy, or something he hasn't managed to find at a discount (but he probably knows the market better than you so this might be hard). And a definite no to Lego-related products, because most of us enjoy the building and display/play part of Lego, as opposed to being a diehard fan of it who must have pictures of it everywhere. 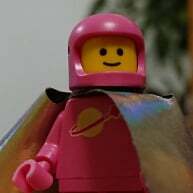 While I'd love my family to get me Lego, I'm always torn between the fact that 1) I'm getting some new Lego yay! and 2) They'll end up paying more for it than necessary because they don't know where to look. But I guess if you have the Lego community on your side, it should make things easier. Focus on the themes he enjoys, and whether you'd like to get something he could do alone, or something you could both do together, is really up to you, based on your past experiences with him of what he enjoys more. Now one gift I'd really appreciate would be tickets to the Lego Inside Tour, and I suspect your husband may be the same if he hasn't been on it. A six pack of beer and an evening away from the wife so I can get some building time. @Jern92 you're too kind, but no worries - he provides me with an endless amount of material. The Lego Inside Tour? Is that the ultimate pilgrimage to Billund? I think the Black Pearl seems more likely than that. @CCC a six pack and a bit of peace sounds very do-able. The first rule of AFOL day is you don't talk about AFOL day. ;). @theLEGOman and everyone else. So sorry, didn't know. Have removed said post. Sorry. What about a mosaic of a photo of the two of you or of an experience you shared together? May be to late to get it ready in time but you actually just have to come up with the photo and the instructions. He is the AFOL so he gets to build it! Check out http://www.brickit.co/Home or explore the mosaic thread on this forum. I would also suggest the #31031 Birds Set as it sounds like you would both like it. My wife also really liked it and even asked me to buy it for her, which I did. It could almost pass as a display somewhere prominent in your home if you would allow it. I also think you should show him this thread because I think HE owes YOU a lovely Valentines Day dinner, with or without the children, whichever you would prefer. I'm agreeing with those that say to avoid any LEGO themed non-LEGO items. As an AFOL I love LEGO blocks, I love LEGO sets and enjoy flicking through a few LEGO books. Thats my hobby. I really don't want every aspect of my life to become LEGO themed. As it happens I have a LEGO keyring that my wife bought me so has special meaning, but thats it. No LEGO t-shirts, no LEGO cups, no LEGO slippers. I might have liked LEGO slippers when I was 10, but not in my 30's. How about a Black Sea's Barracuda rather than a Black Pearl. Its proper old school. And possibly a link to your brick wife blog. Even not knowing you, reading it I feel a bit of the disappointment and heartache you have over what we're very meaningful, presents which were cast aside without another thought. Until someone learns to be truly grateful, nothing you buy for them will fill that void. It's futile to try. And before this comes off high and mighty, on our third year together I dismissed the third consecutive shaving set my wife had gotten me for Christmas thinking only about my wants. I didn't stop to consider how much thought she put into the gift and how meaningful it was for her to give. Since then, I've only gotten exactly what was on my list of stuff. Once I realized how much of a slight it was to her, I set the goal to be more loving and considerate to my spouse and came across this book. It changed a lot of how I viewed the world and, especially, how I act in our relationship. Hopefully, one day, she'll surprise me again with a nice shaving set that comes from her heart instead of Off a running list of thing I'd like to have. It depends on the person; some people like to have other aspects of their life LEGO themed. Also, as AFOLs we tend to know the current catalogue inside out and backwards, which makes me, for one, enjoy getting something completely out of left field and that I didn't know existed. In saying that, I have just now read the OP's blog post and my suggestions are probably along the lines of those that weren't received particularly well. @Steve_J_OM yep appologies if it came across as if i was poopooing your suggestion, rather I was just replying in the context of what had been said (and given as gifts) before. Although you're absolutely right, there will be plenty of AFOLS that like to wear LEGO watches for example and equally plenty more that wouldn't. @brickwife The Art of the Brick is a great experience, and there is indeed a gift shop (assuming the set up is the same across all cities it is in). Some of the art is breath taking, and you don't need to have an interest in LEGO itself to appreciate it. One thing I would recommend is that you build minifig representations of your husband and yourself as a gift. That is a way of including your self in at and it is more from the heart than any particular set. To get the right hair for my wife, I had to buy a Friends set. Otherwise, there is not enough variety for female hair in LEGO. ^^A ticket to Art of the Brick was what I got from my gf as a V-Day gift last year. And in hindsight it was the perfect choice. I got two sets, four pair, for Christmas. They are my new go to sock whenever I have to leave the house. Subtle. I love them. As someone who buys socks as souvenirs wherever I go (think I bought six pairs on my last US trip) I neeeeeed those socks! Never seen them in the UK though. 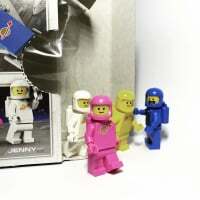 @brickwife I'm afraid I don't have any other suggestions for gifts but it's an awesome blog which is a really good read. Thanks for sharing and best of luck with whatever you decide! Thanks everyone for taking the time to comment and suggest things. It's good to know that just buying a Lego set is actually a good present and what's wanted. It's made me think a lot - my own particular interest is the Golden Age of murder mystery(! ), but if my AFOL got me a duvet cover with Agatha Christie's face on it or a statuette of Dorothy L Sayers in chocolate I might be a little bemused. It's probably the same principle! You can't beat a bit of Poirot or Marple. Now I'm imagining a Christie inspired MOC vignette. Oh dear. I already have too many ideas! (Think my favourite Poirot story is Murder On The Links and for Marple, The Body in the Library). Buy her a brand new R2-D2, but the box must be pristine! @LostInTranslation, believe me, we've already had those conversations. If there was anything at all that could get me in to Lego... I'd be the first in the queue to buy a Death on the Nile set. Oh yes. Or A Murder is Announced. @TheLoneTensor We have an R2-D2 already built - it stares at me every time I sit at the PC and work from home. Luckilly I don't have that problem. I dragged my girlfriend down into the lego pit, although I'm not as fanatic as your AFOL. boxes are ment to be opend, as are polybags. (in my opignion) Your own suggestion of the lego birds set is a very good idea by the way. My girlfriend and I got it together, and build it together as well. Our problem was, we both wanted to build them all. (our funds are not sufficient to buy two). If you go for the 'build it together' option, go for the hummingbird, and you might just finnish in time with him building the other two ;). It is definately the easyest one, and the flower is quite nice to build. Have fun, and good luck getting the gift! anything with actual real lego inside of it. a gift receipt can't hurt. i know it's boring, but i LOVE it when my wife gives me gift cards for the lego store. that's really all i want. the fact that you are even writing this post is an amazing gift to him.